Pebble has cut itself another retail deal, with Target now selling the smartwatch in its stores. The Pebble watch is now available for $150 through Target's retail stores and website. Just like Best Buy, Target is offering the watch in black and red plastic, but also has the white version as a limited-time retail exclusive. Pebble's Website also sells plastic versions in grey and orange. Neither Target nor Best Buy currently sell the Pebble Steel, which has a stainless steel frame. 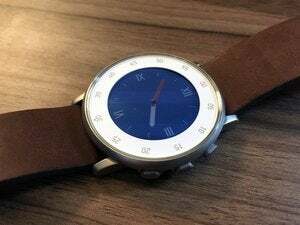 For now, the model is only available through Pebble's Website for $229 with a leather band or $249 with a metal band. Pebble connects via Bluetooth with iPhones and Android phones, and shows notifications for things like incoming calls, text messages, e-mails and Facebook mentions. It also has an app store to expand the watch's capabilities. The added retail availability is a good sign for Pebble, which sold 400,000 smartwatches last year. While that wouldn't be a huge number for a major electronics vendor, it's impressive for a product that began as a popular Kickstarter campaign just two years ago. Pebble plans to double its revenues this year, and sales in Target stores can't hurt. However, Pebble will also face more competition this year. Google is launching its own platform for smartwatches, called Android Wear, with the first watches from LG and Motorola coming toward the middle of the year. The interface looks clever, and developers are already showing interest. Samsung, meanwhile, is doubling down on its own smartwatch line with two new Galaxy Gear watches and the fitness-oriented Galaxy Gear Fit. It's unclear whether Apple will launch a smartwatch of its own or produce some other kind of wearable device this year, though CEO Tim Cook has expressed interest in the space. Pebble may be able to stand out with its focus on battery life. 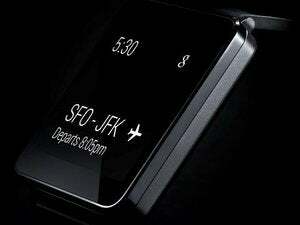 Thanks to its low-power LCD display, the watch can last for nearly a week on a charge. Samsung, by comparison, is promising two or three days on a charge in its upcoming watches, and Google's hardware partners haven't explain how they'll tackle the battery problem. If you do decide to pick up a Pebble, just make sure not to update to the latest version of Pebble's iOS software. The company has warned that a bug in version 2.1 can prevent the watch from working, and while a fix has been submitted, it hasn't been approved or pushed out yet. This story, "Pebble lands in Target stores, warns of bad software update" was originally published by TechHive.